Whereas our ancient ancestors had to hunt for their food, our modern tribes simply visit the supermarket. With all this free time left on our hands, we invented a pastime: sports. A current trend to simulate sports is to participate in esports, a large industry that’s currently growing up around competitive online gaming. 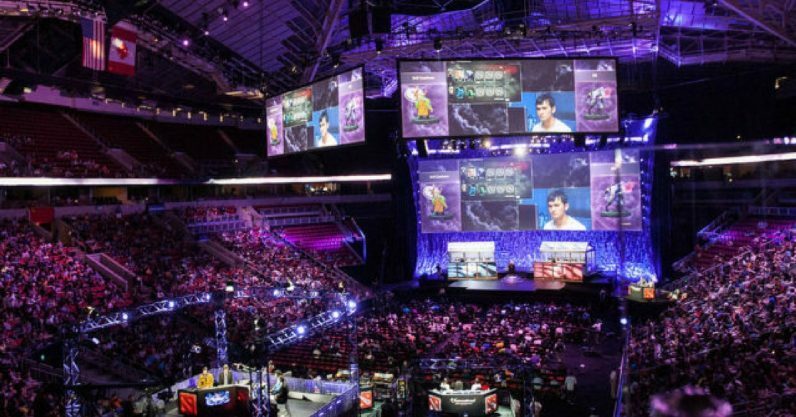 Here’s how esports is taking the ‘sports’ world by storm. In the early days of video games, showing off your skills and competing with other players was a matter of going to the arcade and challenging someone in person. At first, it was about gaining the highest scores. The golden age of the arcade in the late 70s and early 80s saw the release of classics like Space Invaders, Pac-Man, and Donkey Kong. Players would pour hundreds of coins into arcade machines, battling for high scores with their friends – and with anyone else who happened to be in the arcade arena. There was even an urban legend about a coin shortage caused by arcades in Japan, and talk of “Pac-Mania” in the US. This was the beginning of games as a vibrant social and competitive activity. After a decline in popularity in the mid-to-late 80s, arcades had a renaissance in the early 90s, this time catalyzed by the appearance of fighting games such as Street Fighter and Mortal Kombat. In contrast to the most popular games of the golden age, these games put players head-to-head in direct combat. Rather than playing against the game, the competition was now directly between two individual players. In sporting terms, it’s rather like the difference between a time trial and a head-to-head race. Suddenly, there’s more to reckon with than the game itself; you have to handle the tactics, tells and quirks of your opponent. But arcades, replaced with increasingly advanced home consoles, largely lost their appeal, and it would be a while before competitive gaming came to the fore again. While home gaming often allowed for split-screen play, the next step in game evolution as a sport of their own came with the increasing popularity of online multiplayer. Real-time strategy (RTS) and first-person shooter (FPS) games, as well as fighting games like Street Fighter, all moved towards online play during the 90s and 2000s. This new way to play allowed players to connect not just with others in their local area, like the arcade, but with talented gamers across the world. It didn’t take too long for fiercely competitive scenes to develop around games like Counter-Strike and Starcraft, and eventually, casual competition was no longer enough for some pros. After years of honing their skills against amateurs, the best of the best could finally go professional. Esports tournaments have really taken off during the past decade, with the emergence of multiplayer online battle arena (MOBA) games, like League of Legends and Dota. Events like The International, hosted by Seattle’s KeyArena, draw huge crowds and pit pro gamers against each other in person. Digital spectator sports have come full circle: from watching two players go head-to-head at the local arcade, to anonymous competition online, back to the status of in-person competition – but this time with a crowd of millions. Meanwhile, other variants of digital athleticism have developed over the years. Speedrun events like Games Done Quick, which challenge players to get through games as quickly as possible, regularly draw in thousands of viewers and raise huge amounts of money for charity every year. The fighting games community continues to host its own tournaments, where players bring their own “fight sticks”, controllers meant to replicate the feel of classic arcade controls. Collectible card games (CCGs) such as Hearthstone and Magic: The Gathering have their own popular tournaments. And battle-royale games like Battlegrounds, where 100 players compete in a Hunger Games-like survival contest, promise to be the next big thing for sports in the virtual world. In the increasingly digital world we live in, it’s becoming clear that the definition of sport is expanding daily. From exclusively athletic competitions, we’re broadening the concept to include digital phenomena we could only have imagined a few decades ago. For fans of the excitement, spectacle and community spirit built by sport, it can only be a good thing. This story is brought to you by Next Nature Network, a future-driven network organization with a radical view on how nature and technology are fusing.